Heat oven to 400°. Spread 1 tablespoon butter in 15x10x1-inch baking pan. Remove fat from pork. Cut pork into 1/4-inch slices; cut slices into 1/2-inch-wide strips. Mix Bisquick, sesame seed, salt, paprika and mustard. Beat eggs and milk with fork. Dip pork strips into egg mixture, then coat with sesame seed mixture. Place in single layer in pan. Drizzle 2 tablespoons butter over pork. Bake 25 to 30 minutes or until brown and crisp. 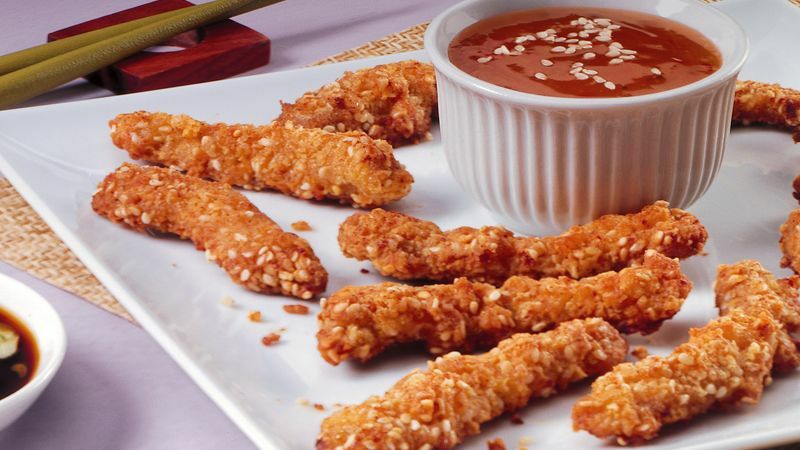 Serve with sweet-and-sour sauce. Go glam by using half black and half regular sesame seeds.